Upon first hearing about this film, I thought it was extremely interesting, not only because of the hype about Heath Ledger's death affecting the film, but also the plot was quite fantastical. After watching this, I was hugely let down. The cover of the DVD would lead you to believe this movie is some sort of epic fantasy film, similar to the likes of Harry Potter, Stardust or even perhaps the Narnia series; at least that was what I was led to believe, and in parts it is. But don't watch this based on pretty box art or you will be fooled. 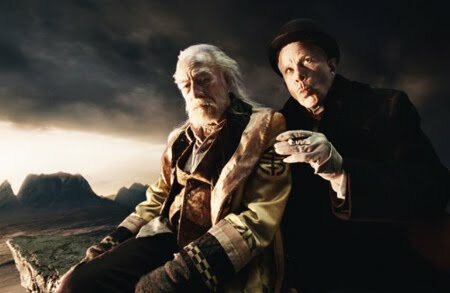 The plot revolves around Dr Parnassus (Christopher Plummer), a man who made a bet with the devil, Mr Nick (Tom Waits) for immortality. Upon dealing with the devil yet again to obtain true love, he promises to surrender his only daughter Valentina (Lily Cole) on her sixteenth birthday. As a betting man, Mr Nick once again makes an offer, that the first person to obtain five souls through the Imaginarium (a mirror that grants the user their desires through imagination upon stepping in) as there are choices within, will win Valentina. 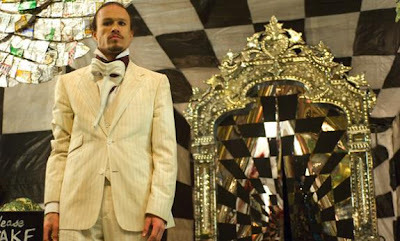 With the help of Tony (Heath Ledger, Johnny Depp, Colin Farrell, Jude Law), they must try to "collect" five souls before Mr Nick to save Dr Parnassus' daughter. I had not read the "blurb" watching this so I pretty much had no idea what this was about, and it was about one hour into the film before all was made clear, by then I had pretty much lost interest and just waited for action, or even signs of action, to take place. 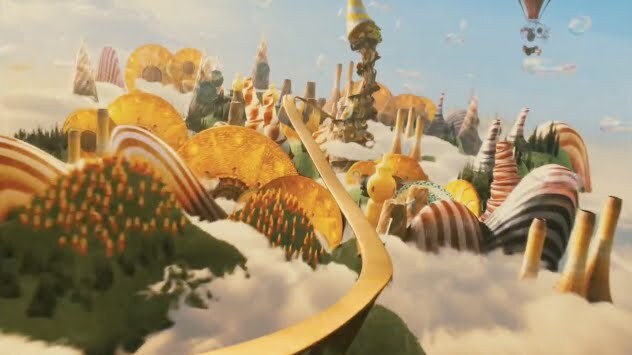 Luckily, we were given a peep into the Imaginarium early on in the film and that pretty much held my intrigue throughout the movie. What is it? What does it do? 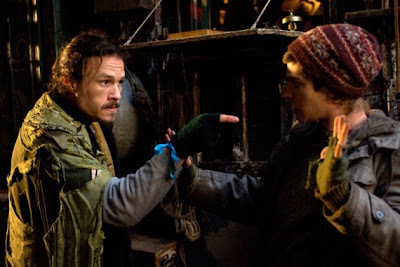 Also early on, the troop picked up Tony aka Heath Ledger, who would prove to be a valued asset in obtaining souls, the actor being one of the reasons I watched this film at all. Despite the film being extremely slow in pace, the direction was unclear and I had no idea when the climax was... I was waiting and waiting, and it just didn't come. Right at the very end, when the climax was supposed to occur, the moment became so cringe-worthy. You will know if you have watched this as to what I am referring to- the "dance" sequence. Also the themes within the movie such has Heaven and Hell, temptation, sin and the like should've been better executed. Not only was it too "tame", there was a Dogma style that made it really annoying. It never goes dark/deep enough, nor is it subtle enough, leaving the major themes stuck in limbo. What I do have to commend in this movie is the Imaginarium itself and the potential that it had. The fantasy worlds that we were able to delve into were diverse and varied. These were the moments I paid most attention and were pretty "sucked up" into this world. The idea of stepping into a mirror that grants desire; multiple conflicting desires and imaginations has so much potential that I feel somewhat robbed after watching it not to have been fulfilled by any of it. Disney Pixar, had they gotten the rights, would've made this into an Oscar winning smash hit animation, or action adventure. Also stars Andrew Garfield, Christopher Plummer, Tom Waits, Verne Troyer and Paloma Faith. I would say Heath Ledger did a pretty good job as Tony for the parts that he was able to act in. There is a quirky Captain Jack Sparrow feel to the role which when Johnny Depp stepped in for his cameo in the first imaginarium was quick to pick up; he made the role his own despite his short screen time. Jude Law suffered a bit more in my opinion and was perhaps the worse of all the Tony's. I like him, but he was wrongly miscast, at least for the segment he was given. Colin Farrell did well in the last Imaginarium sequence, perhaps due to the fact there was a darker side to it. All in all, the use of different actors for the different imaginariums worked well given the circumstances, although none of the actors were given enough screen time to shine. Lily Cole, who plays Valentina, made the role a rather bratty one. I generally like Cole, but in this film, she was just a bit annoying, whiny and dare-I-say chavvy. Perhaps she drew inspiration from St Trinians, where she previously starred. She would've fit right into Skins. It was rather obvious the film was trying to sell her, given she had perhaps the most screen time. Andrew Garfield made a good impression on me in this film and I wish there was more of him, but I guess I can wait for the new Spiderman, or Never Let Me Go, where he stars alongside Keira Knightley. It was also a pleasant surprise to see Paloma Faith in the film having a cameo role. I always get her and Marina (from Marina and the diamonds) mixed up facially... but yeah, she was a nice extra; shame she didn't get to sing. The DVD has a large amount of extra features which include several Heath Ledger ones (Interview, Wardrobe Test); Director's commentary, Deleted Scenes, Feature on the Imaginarium, "Behind the mirror" and a UK premiere featurette. Such a shame I did not enjoy the film at all, hence giving me little/no pleasure to view these extra features. 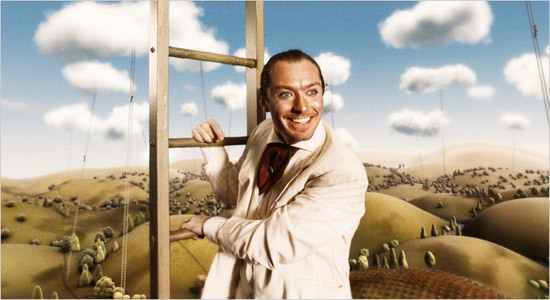 Anticlimatic, boring and simply wasted, The Imaginarium of Dr Parnassus will bring no joy to adults or children, leaving you feeling robbed. Thank God Inception was released, which in a way redeems certain ideas I liked in the movie. There is a good cast, has great potential, but badly executed. Plus, the English chav accent is extremely annoying. I highly recommend not watching this; I watched it so you don't have to. Where can I get my refund?